The decision to invest your money can be tricky. From which stocks and shares to invest in and to how to spread your risk, read on to discover how you can find the investment plan that suits you. A Stocks and Shares ISA, also frequently referred to as an Investment ISA, is a type of account which allows you to buy investments such as shares, bonds and property. The returns you earn from your investments are exempt from UK taxes, so your money has more chance to grow. ISAs are a great way for UK residents to invest and save up to £20,000 per tax year, which starts every April 6th. You would like to invest your money but want to protect any profits or interest from tax. You don’t expect to need access to your funds in the short term. Instead, you would prefer to keep your money invested for a few years - although this is not essential. You can invest and withdraw your money at any time, some providers have penalties for doing this, others don’t. You are comfortable with the fact that your Stocks and Shares ISA investments can go down as well as up, meaning you could get back less than you originally invested – depending on your appetite or the level of risk you want to take. Healthy investments go up and down over the short-term, which is why investing should be considered a long-term strategy. Shares - owning a portion of a company, like Apple. Commodities - could include energy, livestock, and metals such as gold and silver. Property - residential and commercial property. Corporate and government bonds - bonds lend money to an entity, which, in this case, would be the government or a company. Investment funds: a bit like a hamper full of tasty investments including all those above (i.e. shares, bonds, property, and commodities). Ethical Investment options – investments that aim to exclude activities considered harmful to society and the environment. A Wealthify Investment ISA, for example, contains up to 20 funds, which in return can hold thousands of underlying investments. Your ISA allowance totals £20,000 each tax year, and you can invest this into any type of Investment ISA. You won't pay income or capital gains tax on any returns you make. The deadline to use your 2018/2019 allowance is midnight on 5th April 2019, when your new allowance will refresh for the next tax year. This means depositing a sum of money in one go – rather than paying in regularly. It can be any amount from £1 right up to your full ISA allowance of £20k. If you do this, you can still add to your investments regularly. If you are not able to invest your lump-sum into your ISA, you might want to add regular monthly deposits instead. Drip-feeding your annual allowance over the year by setting up a regular monthly Direct Debit can really help your money to grow. When it comes to investing you can either do it yourself, or a use a digital investing service, such as Wealthify. A do-it-yourself platform is well-suited for those who have some experience with investing. But if you’re too busy to pick your own investments, or don’t have the confidence to do it yourself, you might prefer to opt for a robo-advisor that will do the hard work for you, from building your investment plan to managing it. It’s important to consider which provider you’d like to go with. There are many to choose from, but it’s worth noting that you’ll typically be charged an annual fee by providers to manage your investments. Make sure you shop around and check providers with the lowest fees – that way you can keep more of your potential returns. 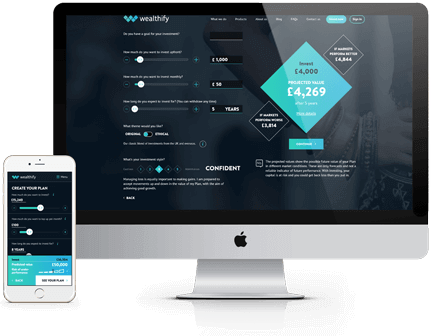 Robo-investors like Wealthify aim to take the hassle out of investing, by managing your money for you. You will receive a Personal Investment Plan based on the amount of money you’d like to invest, whether it be a few Pounds, or £1 million. You choose the level of risk you’re comfortable with, from cautious all the way to adventurous, and even pick an ethical plan if you’d like your Stocks and Shares ISA to invest in companies doing good. You don’t need any knowledge or experience to invest, they will do it all for you. There is no minimum investment. You can start investing with Wealthify from as little as you like. Costs and charges are straightforward – you pay one simple annual management charge which covers all the management of your investments. If you do all of this yourself, the costs could quickly add up. Annual fund charges and transaction cost are also made clear as part of the overall cost of investing. You can withdraw funds anytime, if you need to, without notice or a penalty. You can access your plan wherever you are, 24/7 on any device to see how it’s performing and which investments you own. Robo-investors could be a great choice for anyone who is unsure about how to get started with an Investment ISA. Let the experts manage your investments for you and you can simply reap the potential rewards. A Junior ISA will allow you to prepare for your little ones’ futures, giving them a head start in life. Junior ISAs work in a similar way as adult ISAs, except their annual allowance is £4,260 rather than £20,000. Your child can have either a Junior Stocks and Shares ISA or a Junior Cash ISA, but they can only have one of each throughout their childhood. Similarly to an Adult ISA, they also won’t need to pay any UK tax on their returns. As soon as they hit 18, their Junior ISA will become an adult ISA and they’ll get full access to their funds. Before their 18th birthday, their money is locked away, meaning nobody, not even you the parent can touch it. There are many reasons you might want to transfer your ISA to another provider and consolidate your portfolio. You might want to do this if you are paying higher fees or have found another provider that would be better suited to you. Did you know? You can transfer your Cash ISA to a Stocks and Shares ISA, and vice versa, but make sure you use the official transfer form to maintain the tax-efficient benefits coming with your account. Do your research and find a provider that is right for you. Contact your new provider to open an account and complete an ISA transfer form. Your new provider will contact your current provider to carry out the process. You won’t need to do anything else. The switch will be completed by both providers. All investments carry an element of risk. The performance of your Stocks and Shares is not guaranteed, and while the value can increase it could also decrease. This is why it’s essential to ensure you choose a risk level that’s right for you. If you’re worried about picking your own investments, get Wealthify to manage your portfolio for you. If you are new to investing, start by using an investment amount that is suitable for you, and simply watch how it performs.